Vintage Diamond Halo Engagement Ring | Shane Co. 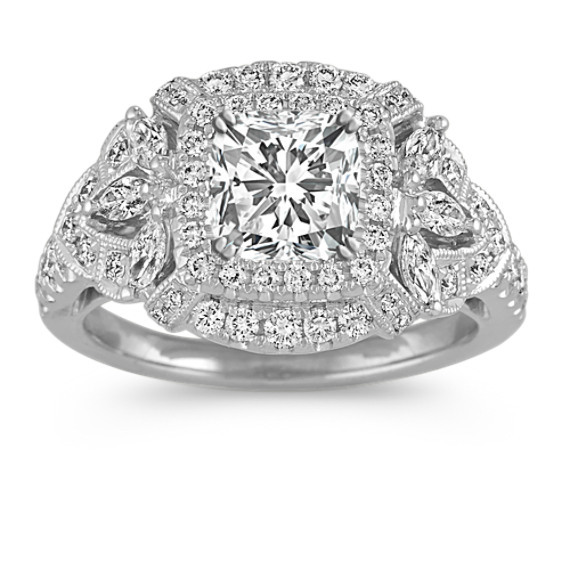 This engagement ring radiates beauty with 76 round diamonds (approx. .58 carat TW) and six marquise diamonds (approx. .28 carat TW). Each diamond has been hand-selected for superior brilliance and is pavé-set in quality 14 karat white gold with vintage-inspired milgrain detailing to complete the design. Popular choices of center 1.00 carat diamonds to complete this halo setting include round, princess cut, and cushion cut. Gemstone Carat Weight :.28 ct. t.w.